I am often asked some variant of the question: “I’ve written a book. How do I self-publish it?” The question, as well as the answer, can feel overwhelming. Certainly whenever I’m asked, I often think, where do I start? What level of detail do I share? How much of my time can I give to assisting? Time is unfortunately a commodity I have very little of nowadays, but I also love to help others, especially those serious about pursuing their creative endeavors. This article attempts to achieve that balance. What This Is: The basics to get someone started in publishing, to get their feet wet. To literally get a book for sale and ready to market. Things you need to know before you publish, and the places you can go to do so. Be an Angel and Help Me Score a Victory! Love it and I’m voting for you, good luck!! YOU, yes, you, can help the cover of my book, Angel Messages, a wing and a prayer, WIN this week’s Cover Wars at Author Shout. By taking a moment and it really does only take a moment, to pop over and VOTE, you contribute to the victory. We have Thursday, Friday and Saturday left. The voting will cease as of 7:59 am EDT on Sunday morning. So when you vote, say at 4pm today, you can vote again after 4pm on Friday and again after 4pm on Saturday. Now be aware that if you attempt to vote sooner, the little poll will move, looking all the world as though it registered your early vote, but please trust me when I tell you, this is not the case. Well, I didn’t *really* want more competition but I’ll do the right thing and pass it along. I’d say Sally, with her “hot buttered lobster” imagery, is going to be very tough to beat!! I was here a few months ago and issued a 79-word challenge. I asked you to write a 79-word story with plot, character development, and all the stuff good stories are made of. And I must admit that you all came through with flying colors. Because you were all so damn smart, I’m back with a new challenge. This time it has to be exactly 27 wordsnot counting the title. You must tell a story bringing Facebook into it—at least tangentially. Give me Gone with the Wind in 27 words. This time there is a grand prize. Infuse your stories with your soul. Make us want to hang our heads and cry at your angst. Am I Producing Leaves or Flowers? Indeed….profundity in this short post. And they both grew in the shape of hearts, Luanne, so, for me, it seems that it matters not whether your output is leaves or flowers; love’s a-blooming. Lots of ideas for blog posts have crossed my mind lately. Then they have kind of walked in reverse back out of my mind. Everything seems “deeper” than I can handle currently. You should see how cute Kana is sleeping next to me, by the way. I figured out how to keep her from annoying Tiger who sleeps in the corner of the window seat: I put a big piece of two way tape across the opening where Kana would lie to intimidate comfort Tiger. Tiger can walk over the tape to get to her safety spot, but Kana can’t lie there without discomfort. So far, so good! 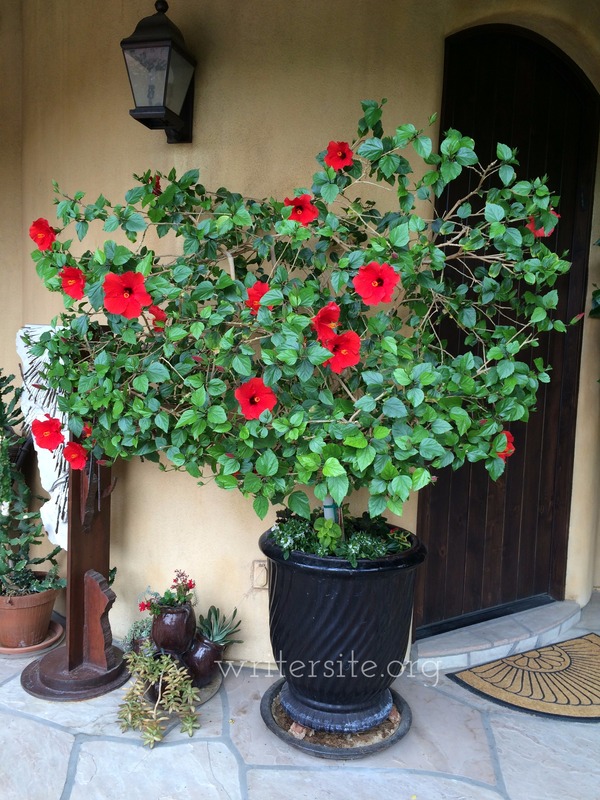 I just noticed that the two hibiscus bushes that flank my front door have gone in different directions this year. In the past, they looked very similar. But look at them now! Let’s call this one A. Great guest author post, enjoy! My name is Andrew Joyce and I write books for a living. J.D. has been kind enough to allow me a little space on her blog to promote my new novel RESOLUTION: Huck Finn’s Greatest Adventure. I think it’s a good book, but what do I know? Anyway, I’m kinda shy about tooting my own horn. So I think I’ll turn things over to my dog, Danny. He always has an attitude and usually does not speak highly of me. But please understand that we co-exist as the old Soviet Union and the United States once co-existed. We tolerate each other. So without further ado, here’s Danny the Dog. Knock, knock . . . who’s there? ‘Tis I, Zoe the Fabulous Feline, and I thought that today I would open my story with that timeless joke. But alas! It loses something if the one being pranked is not available to answer in the flesh, so I guess I will just go on with my story instead. And speaking of flesh, this story is the naked truth and one I think you will enjoy.